Precision Dynamics-St. John (PDC-St. John), a global provider in health care identification solutions, will roll out its latest innovations in automated patient identification at this year’s Healthcare Information and Management Systems Society (HIMSS) conference and exhibition in New Orleans. The company’s RFID wristband systems are designed to help health care organizations meet mandated requirements of the Centers for Medicare & Medicaid (CMS) for electronic tracking of medications. 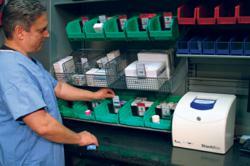 Based on requirements set forth by the CMS, hospitals must track more than 10% of medication orders using assistive technologies, such as RFID with electronic medication administration record (eMAR) by 2014. 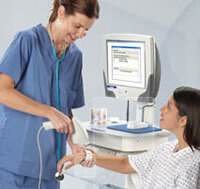 At HIMSS13, PDC-St. John will demonstrate the features and benefits of its automated patient identification solutions to help improve patient safety and care, enhance overall patient experience, and comply with important safety regulations, including CMS meaningful use criteria. HIMSS attendees will experience the PDC Smart Wristband Dispensing Kiosk, which allows patients to conveniently secure hospital appointments online and then quickly register at self-service PDC Smart Wristband Kiosks stationed at the hospital, providing operational efficiencies for healthcare organizations. The HIMM 2013 Annual Conference and Exhibition will take place from March 3 – 7, 2013 at the Ernest N. Morial Convention Center, New Orleans.